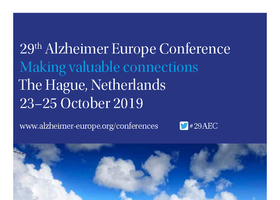 Alzheimer Europe, Alzheimer Nederland are calling for abstracts for the upcoming 29th Alzheimer Europe Conference in The Hague, Netherlands. The call for abstracts will close on 30 April 2019. Click here for more information. International trends are playing out in the European context in unique and dynamic ways. Brexit, increased migration, rising nationalistic values, polarization, health system reforms and individualistic governance trends are all influencing how Europe positions itself on the global arena. Health inequalities continue to exist within European countries, as well as stark employment, income and health inequalities are seen between Western, Central, and Eastern European countries. Parallel to these transitions is the voice of the European citizens. The citizen response has displayed an increase in bottom-up initiatives, displaying solidarity and action in these dynamic times. These transitions all influence dramatically the occupational lives and health of communities, groups and individuals within the European context. This conference will explore the impact these global transitions have on the occupational lives and health of individuals, groups and communities in Europe and will pose the question: What can occupational science contribute to this transitioning context and the challenges and possibilities it presents? Occupational Science in transition: what is the methodological and theoretical response required by Occupational Science in the dynamic European context of today?